Baseball. Football. Cricket. Trench warfare. All of those things are occasions where being able to lob something at a target from a long distance is a good skill to have. But using that good arm to chuck Fedex deliveries onto a customer’s porch from 20 feet away will not garner praise, especially when you’re (allegedly) caught on camera doing just that. A customer in Maryland who has a home security system that records video and emails the homeowner snapshots when the motion sensors are set off reportedly caught the delivery guy chucking a box onto the concrete porch from quite a distance. 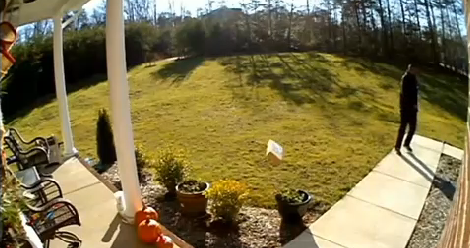 MyFoxDC.com has the footage of the driver standing at a distance from the porch and launching the package on its quick flight. While its contents weren’t breakable — the package contained clothing for a doll — that’s not the real issue here, the customer says. After the homeowners complained to FedEx, the driver in question was fired as a company spokeswoman says managers are “shocked” that the employee chose to deliver packages in such a manner, because that’s not actually how they’re supposed to do things.